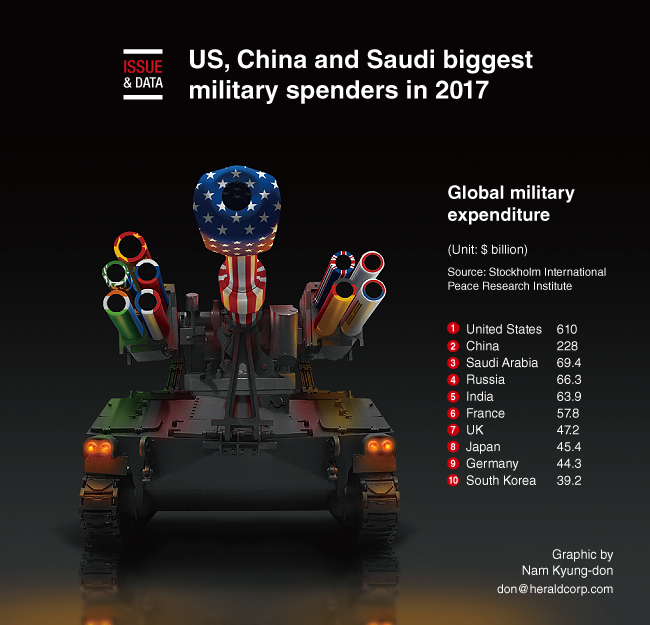 Global military spending rose in 2017 to its highest level since the Cold War, with the United States, China and Saudi Arabia topping the list, a Swedish research institute said. The Stockholm International Peace Research Institute estimated that global military expenditure totaled $1.73 trillion in 2017, up 1.1 percent on 2016. The United States remained the world’s largest spender with $610 billion, unchanged year-on-year. The US accounted for over a third of global military expenditure. Second-placed China was estimated to have spent $228 billion. South Korea ranked in 10th place, spent $39.2 billion in 2017.